Jaisal Singh, intrepid traveller, former polo player and an "accidental hotelier" loves the hinterlands of Rajasthan. At his tented luxury camp Sujan Jawai in Rajasthan, he never tires of watching the nomadic Rabari herdsmen and the occasional leopards sunning themselves casually on the surrounding granite hills. 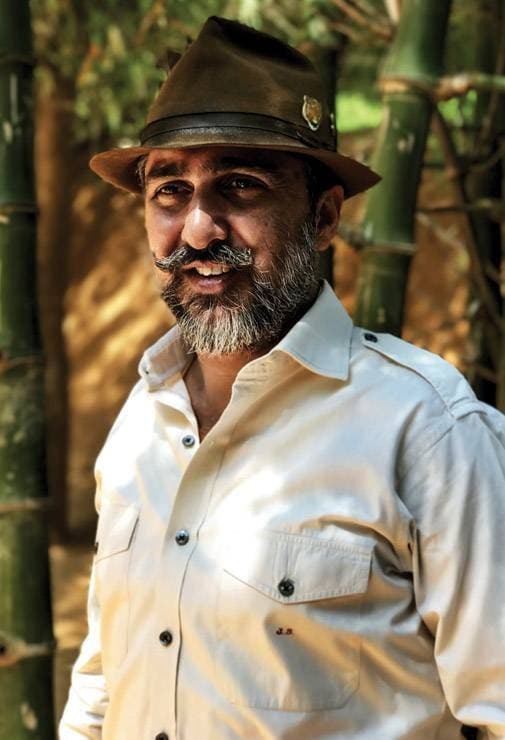 Singh is the force behind Sujan, a brand of experiential, high-on-design uber luxury properties in Rajasthan and across the Indian Ocean in the grasslands of Kenya's Masai Mara wildlife reserve, catering to the creme de la creme of travel enthusiasts. The luxury hotel chain prides itself on exclusivity, and that is evident by its relatively limited room inventory. "For the 18 years we've been around, it's never been about selling hotel rooms. We are purveyors of experiences of a lifestyle," says Singh, Sujan's chief executive, and also the Vice President of Relais & Chateaux (R&C), an association of some of the world's most unique boutique hotels and top chefs. 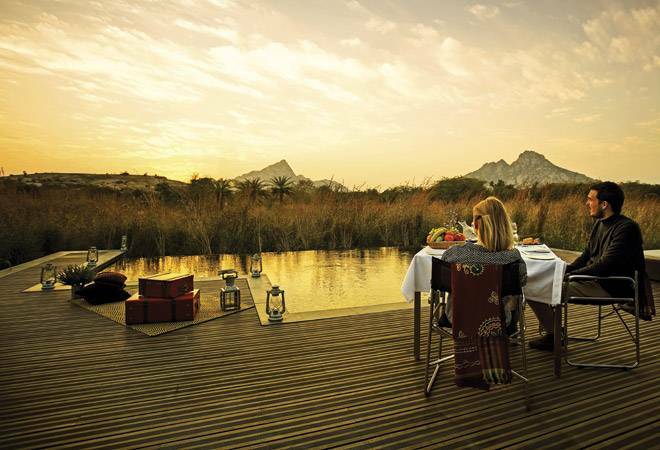 So, at all Sujan properties, while guests are pampered, they are also treated to experiences such as breakfast in the bush, picnic in the wild, lunch by the lake and dinner under the stars. At the Elephant Pepper Camp, set underneath a grove of fig and elephant pepper trees, in the wilderness of Masai Mara, there are 10 spacious luxury tents. Of its four properties in Rajasthan, Sujan The Serai Desert Camp and Spa is the biggest with 21 tents, set on a 100-acre private estate cheek-by-jowl with the Golden City, Jaisalmer, and the mighty Thar Desert. Sujan Jawai, which has 10 luxurious tents, personally designed by Singh and his wife Anjali, is in sync with the ecosystem in the heart of Rajasthan's wilderness. Sujan Sher Bagh Ranthambhore, the other luxury-tented property, has 12 tents, and away from the wilderness in the heart of Jaipur is the Sujan Rajmahal Palace that offers 14 palace rooms, suites and royal apartments. The top accommodation here, the 5,000-sq-ft Maharani Suite, comes with its own private pool and costs nearly Rs 9 lakh a night. Travellers arrive to a very non-hotel feel. As a guest you'll be expected to sign only twice - at check-in and check-out. Unlike other luxury hotels, the laundry, Internet connection and mineral water are all on the house. Room service won't be charged extra; there will be no promotional tent cards cluttering your bedside table, nor televisions to mar the experience. Besides, the chef will drum up whatever you fancy, even if it is off the menu. Sujan strives to take guests right to the heart of India's heritage. At the Rajmahal Palace, you could experience royalty up close, while at Jawai, you can witness how humans and the big cats co-exist in a semi-pastoral, semi-agrarian landscape. "We don't believe in 'one size fits all'. Each of our properties is distinct and true to where we are," says Singh. Tents at Jawai are priced at $1,000 a night (plus taxes), while rooms and suites at Rajmahal Palace cost in the range of $600 to $ 13,000 a night. Singh says that Sujan never sets tariffs based on what others charge. This is not a brand that is likely to offer you a 'deal'. "We charge what we believe is correct for the experience we provide. And people have always been happy to pay for quality," Singh says. All four of Sujan's properties in India are members of R&C, which is a global benchmark in the world of boutique hotels and gastronomy. Being a part of it, says Singh, has opened up new markets for him, like the United States. "I didnt plan to be a hotelier," says Singh, who is away from home for at least two-three weeks in a month, flitting between his properties. His tryst with the hospitality business is a result of his affinity towards wildlife, particularly the Ranthambhore tiger reserve where he has spent the better part of his childhood, and his lack of interest in going to college. For Singh, wildlife and tigers have been a way of life - his father Tejbir Singh and uncle Valmik Thapar are well-known tiger experts. 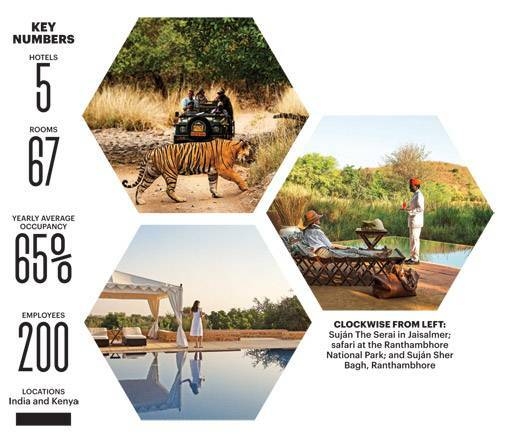 His first business outing, the Sher Bagh Ranthambhore, was an instant success. In the very first season, Adrian Zecha, owner of the experiential hospitality chain Aman Resorts, came for a stay and was impressed with what Singh had built. "He wanted to build the first 'Aman' in India with us," Singh recalls. Aman-i-Khas threw its tents open in 2003. While it was a great learning for Singh, in 2008, he decided to expand his own company as he didn't see much opportunity for growth with Aman Resorts. So, in 2009, he had The Serai, Jaisalmer up and running, followed by Sujan Jawai in 2013. By 2015, the royal family of Jaipur entrusted him with the management of the iconic Rajmahal Palace. The property reported a healthy operating profit within the first year itself, unusual in the competitive and saturated market of Jaipur. The niche segment that Sujan operates in could prove to be limiting. The small room inventory, the fact that three of its properties shut down in the blistering summer heat of Rajasthan, the dependence on high-paying foreign tourists and narrow growth opportunities, are restrictive factors. Singh admits that expansion for Sujan is tougher because the brand is not a cookie-cutter. "We don't take one blueprint, build four properties and make a few 'soft' changes. Every property 'must' be different, from aesthetics to the experience. So that's a limitation, but not a hindrance," he says. Singh is optimistic that there is a segment of Indians that is looking not for 'deals' but unique experiences. Sujan has witnessed a surge in the number of Indian guests over the years - from 20 per cent Indians in the past, today the chain sees 40 per cent. Barring Rajmahal which is a year-round destination, the three tented properties of Jaisalmer, Ranthanbhore and Jawai are seasonal. Overheads in the non-operating months (since the staff is paid year-round) make things tough. "We have to run a very tight and efficient ship to remain profitable, which, I'm proud to say, each of our properties are," he says. Despite the odds, the average occupancy across the properties stands at 60-65 per cent. The average spend per guest, per night, is about $1,000 at least (exclusive of taxes). Singh has been working with his wife towards growing the Sujan brand over a decade now. Staying experientially true to the location that Sujan operates in, commitment to responsible tourism - one that provides a high level of service and luxury yet benefits the local communities - are some of their constant pursuits. "Our authenticity of aesthetics and experiences, and our team is the heartbeat of Sujan," Singh declares. Out of the 200 people that Sujan has employed, 80 per cent are locals. Right now Singh is exploring a host of interesting opportunities, within and outside Rajasthan. He believes that in India we haven't even scratched the surface as far as high-end experiential tourism goes.